It hasn’t been a week since the Detroit Auto Show, but Ford has even more news: The acclaimed Mustang is being refreshed for the 2018 model year. We attended a background briefing about the Mustang to bring you the first details. 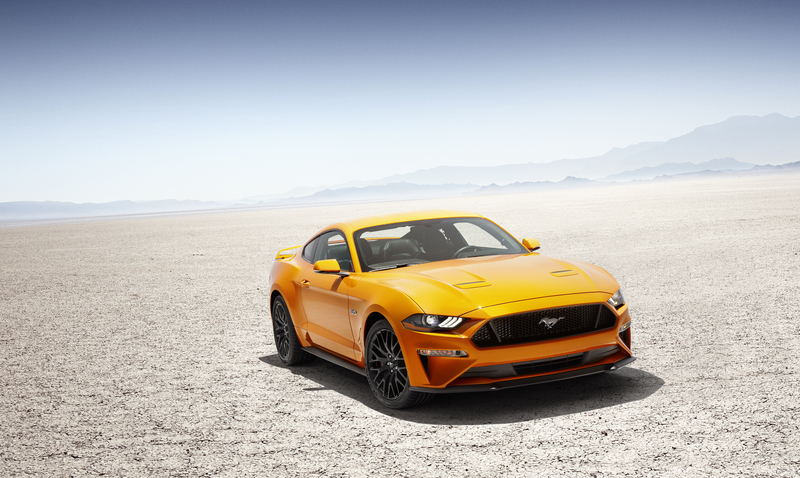 Ford isn’t ready to release specifics on the revised Mustang’s horsepower and torque, but chief engineer Carl Widmann hinted that the highlights will be more power available when you need it most. It wouldn’t be a proper refresh without more power. The 2.3-liter turbocharged four-cylinder will have “more available” boost, as well as a higher torque figure. Expect incrementally more power from the V-8, too. (For reference, the engines currently produce 310 and 435 hp, respectively.) Both engines will be available with either a 6-speed manual or a 10-speed automatic transmission. You’ll be able to spot the four-banger by its dual exhaust pipes, and the V-8 by its quads. Rear-drive remains the only way to spec a Mustang, despite an ante upped by the AWD Dodge Challenger GT. 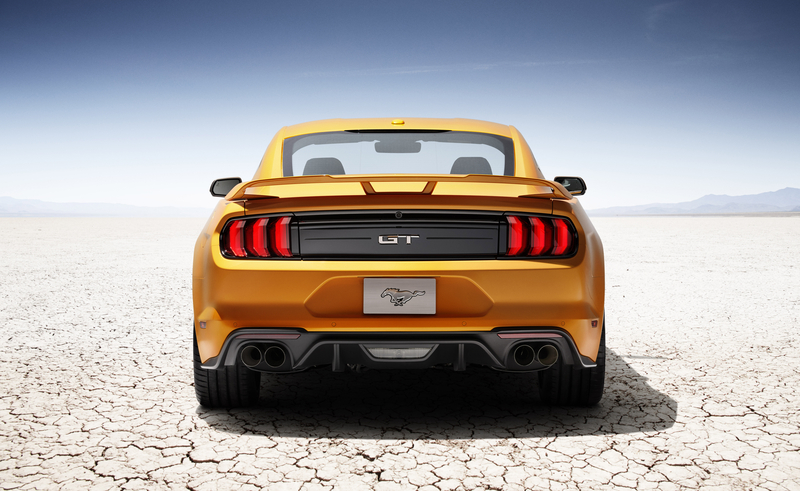 Wondering about the enhancements to the current Mustang’s standard 3.7-liter V-6? As the Mustang matures, it’s dropping its V-6 engine in favor of the hotter-selling turbo four and naturally aspirated V-8. That’s no surprise: Almost half of the Mustangs sold around the globe had the four-cylinder engine under the hood. You’ll have to wait until the seventh-generation Mustang for the anticipated hybrid model. The Mustang evolution benefits from enhancements from higher-order Mustangs, like the Shelby GT350. A trickle-down theory toward parts means that MagneRide will be available for the first time on non-Shelby Mustangs, as will an Active Loud Exhaust — with a Quiet mode for creeping into the driveway after a long evening drive. Stickier tires are also part of the equation: The new Mustang will be among the first vehicles on the road to offer Y-rated Michelin Pilot Sport 4 S tires. The components of the previously optional Performance Package (among them larger wheels, summer tires, and a Torsen differential) are now standard on the V-8-equipped GT models. As a whole, this is a mid-cycle refresh for the Mustang, ahead of a redo in several years’ time. That explains the evolutionary styling, which only affects its front and rear. The side profile is unchanged. The front headlights now angle downwards, in the vein of the Jaguar XJ, Ram 1500, and Galpin Rocket. (Only one of those is a Mustang derivative.) It takes a keen eye to notice the 3-D-inspired taillights. Wheels in 10 new designs range in size from 18 to 20 inches in diameter. All of these styling enhancements will affect the Mustang Convertible, when it later debuts. The Gen-6.5 Mustang will be the first to offer a customizable digital display from the factory, and it looks awesome from the driver’s seat. Think of it as the same level of sophistication as the instrument cluster of a McLaren 570S, configurable by color and what’s on the screen. The digital display will be standard in most European and Asia-Pacific markets, but it’ll be an analog cluster for base Mustangs in the U.S. Despite the mild makeover, there are still some surprises to note. Press the “pony button,” a.k.a. 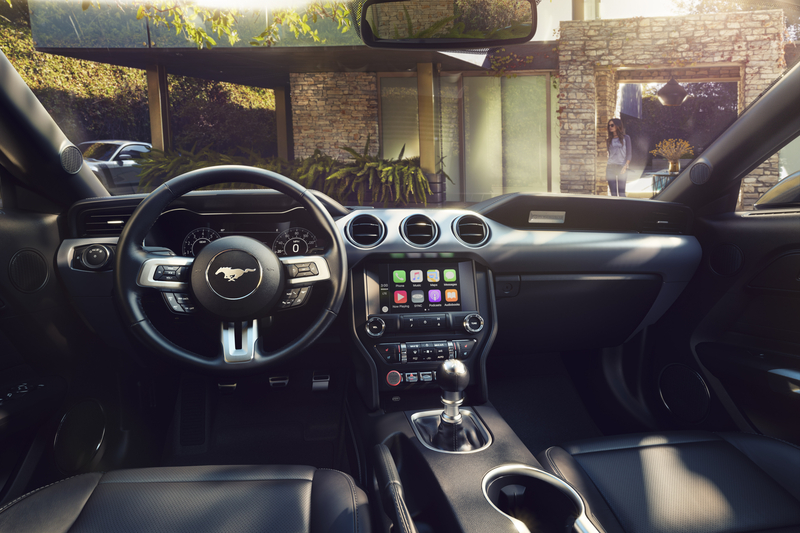 the steering wheel button with a Mustang icon, and you’re taken to the customization menu. There are also more Mustang badges than on the previous car — just in case you have a momentary lapse and forget which pony car you’re driving.